Extends and distribute DVI / VGA signal with bi-directional RS232, USB signal, IR and analog audio signals over LAN. Transmission range up to 150m over CAT5e, 180m - over CAT6. Supports window based management software, using PC computer for easy setting input/output link. Supports Android / iOS app control. Receiver input source select could be from IR remote control or front panel button. HDMI 1.3b and HDCP compliant. Built in Bi-Directional analog audio transmission (only in point to point mode). HKM01BT/DKM01BT/VKM03BT transmitter unit built in HDMI/DVI/VGA local loop output. 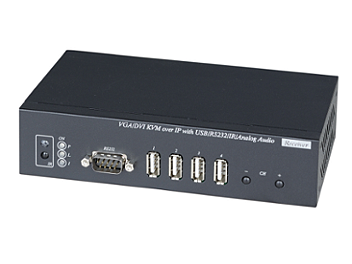 HKM01BR/VDKM01BR receiver unit with 4 ports USB devices (1 port USB 1.1 & 3 Port USB 2.0), to extend USB peripheral devices, such as flash disk, hard disk, keyboard, mouse, etc. The system could be mixable on TX/RX by HDMI (HKM01B), DVI (DKM01B), VGA (VKM03B) series products.